Google has released an update to the Google Device Assist app for Nexus, Google Play edition and Android One devices running Android Lollipop. The new 1.2 version for those keeping score at home, brings several new tips as well as rich media content for more engaging tips for users. If you are not familiar with the Google Device Assist app, it is designed for beginners, intermediate and advanced users of Google devices that gives you tips and tricks as well as a great resource of information on how to get the most out of your device. There are also a issue detector built into the app that can proactively inform you of issues so they can be addressed. You can also get live tech support (Canada, France, Germany, Italy, Japan, Spain, UK and USA) through the app to help you troubleshoot issues or get help with something. In the latest update, the Google Device Assist has several new tips built in to give users more help on using their devices. There is also improved detect issues content in the app to give you a clearer understanding of what is going on with your device and the particular issue you are facing. The content on how to resolve the issues is much more informative in this release. The bigger change is the new rich media content on tips. Now you will see many more animations than in the previous build to more accurately walk you through how to do something on your Google device. Finally you have the ability to share tips and receive tip notifications on your device through the app. 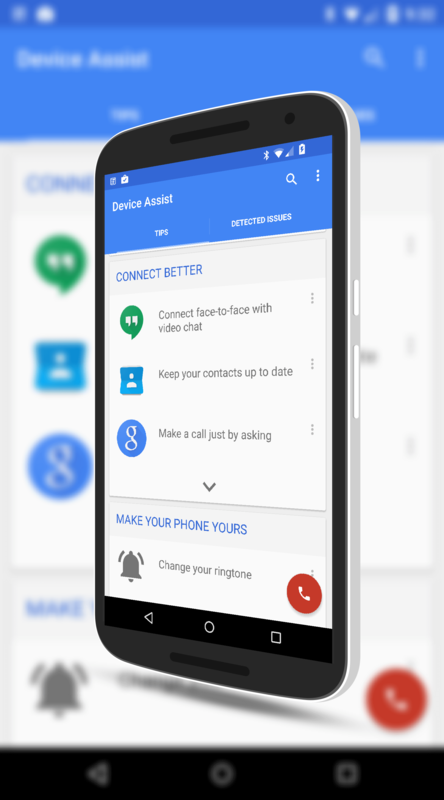 While many advanced users of Android devices will find the Google Device Assist app a bit simple for their needs, for those who are new to the platform or new to Nexus devices, it can be a big help in getting things setup and sorting out any issues you may encounter. It is a free app regardless so even the most experience users should download it. There is likely a gem of a tip to be found for all users of all levels.